Managing information in a data-intensive world means holding on to all the little pieces in one hand without letting go of the reins in the other. From customers to calendars, inventories to operations, there’s a lot to keep track of and it never stands still. Stop with the post-it notes. Throw out the printed paper forms. How about a single location for all your data that can be accessed by everyone – whether they’re working from the office or on the road? And it’s password-protected. For both Windows and Mac. With the ability to output schedules, itineraries, contact lists – even a preview of website updates, bulk emails and printed reports. An integrated database to manage all your administrative needs. 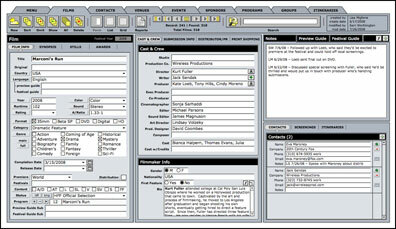 With auto-fill lists, hyperlinked data, photo storage, scheduling, comprehensive reports. Customized. Take a look at some of our designs or see what we’ve done for our clients. Click here to learn more about the design process, or if you’re ready to get started, give us a call at (323) 662-9692 or email info@evworks.com.